Entrepreneurship is a forward looking activity that embodies implicit imaginaries. If we remove the notion of a future from the field of entrepreneurship, field would cease to exist as its whole rationale is prospective. Entrepreneurship creates future value (Schumpeter, The theory of economic development: an inquiry into profits, capital, credit, interest and the business cycle. Harvard University Press, Cambridge, MA, 1934) through creative destruction, in uncertain contexts (Knight, Q J Econ 37:579–624, 1923) and with “alertness” to opportunity (Kirzner, The theory of entrepreneurship in economic growth. In: Kent CA, Sexton DL, Vesper KH (eds) Encylopedia of entrepreneurship. Printice Hall, Engelwood Cliffs, 1982). Entrepreneurial opportunity embraces anticipation as imaginative reason, strategically employed and motivated by aspiration. Entrepreneurial effectuation is concerned with the controllable aspects of an unpredictable future. Entrepreneuring is a process (Steyaert, Entrep Reg Dev 19(6):453–477, 2007) producing ontological emergence. Entrepreneurship is expressed in action and produces change. Nadin observes that anticipation relates to the perception of change (Nadin, Int J Gen Syst 39(1):3–33, 2010) and is always expressed in action (Nadin, Int J Gen Syst 44(6):621–630, 2015). Entrepreneurial identity is significant and the models embodied in an anticipatory system are what comprise its individuality and what distinguish it uniquely from other systems. A change in these models is a change of identity (Rosen et al., Anticipatory systems: philosophical, mathematical, and methodological foundations, 2nd edn. Springer, New York/London, 2012, p 370). Entrepreneurship is relational and is coupled with other actors in the environment, generating a sense of shared anticipation, or anticipatory coupling. Anticipatory coupling as a social phenomenon seems ripe for further research. Being emplaced, entrepreneuring practice involves sensing and anticipation (Antonacopoulou and Fuller, Practising entrepreneuring as emplacement: The impact of sensation and anticipation in entrepreneurial action. In: Entrepreneurship and regional development (in print), 2019). 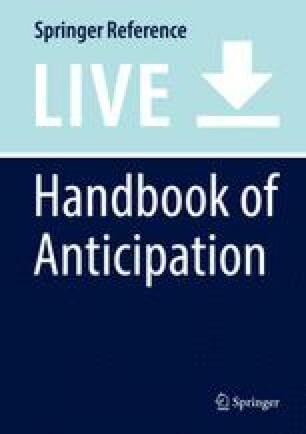 Although anticipation is a natural activity, the effectiveness of anticipation can be improved through greater awareness in each of these sets of processes, among others. We suggest that the dynamics of emergence require anticipations of multiple forms of value. Seeing entrepreneurship from an anticipatory standpoint brings more to the fore the nature of values in practice. Further research can help reveal the anticipatory work is done in entrepreneurship to maintain the anticipatory capacity of the enterprise and of the interdependent relationships that maintain the enterprise?